ENVOY 05-09 4.2L. GM 88963627 reservoir. SA 88963627 reservoir. Includes the reservoir. GM 26112229 pump. SA 26112229 pump. TRAILBLAZER 09 4.2L. BRAVADA 04. 1973-1978 CHEVROLET P10. 1973-1978 CHEVROLET K10 PICKUP. 1973-1978 CHEVROLET K10 SUBURBAN. 1973-1978 CHEVROLET C10 PICKUP. 1973-1978 CHEVROLET C10 SUBURBAN. Suspension & Steering. One New Power Steering Hose Alternate/OEM Part Number(s): 35525, 4075, 4950, 71070, 71536, 71871, 7814277, 7819065, 7828164. One New OEM GM Power Steering Pump. FREE Trial! No Labor Warranty. · We strive to earn 100% perfect "FIVE-STAR" scores from you. Oem 26081016 power steering pump Gmc Chevy.New opened box sealed inner bag. GM 26091879 pump. GRAND AM 95 4-138 (2.3L), w/o variable assist power steering. GRAND AM 96-98 4-146 (2.4L), w/o variable assist power steering. GRAND AM 99-00 2.4L, w/o variable assist power steering. Model: GMC TERRAIN. GMC TERRAIN 10-12 electric. Power Steering Pump/motor. Part Grade Abbreviations. cc = Credit Card size units. C = Greater than 200k miles. B = Greater than 60k miles and less than or equal to 200k miles but greater than 15k miles per year. 1980-1986 CHEVROLET C20 PICKUP. 1980-1986 CHEVROLET C20 SUBURBAN. 1980-1986 GMC C3500 PICKUP. Suspension & Steering. One New Power Steering Hose. One New Power Steering Hose Alternate/OEM Part Number(s): 26006310, 35488, 4103, 71782, 7833724. SIERRA 3500 PICKUP 07 new style (smooth door skin), diesel. SIERRA 3500 PICKUP 08-10 diesel. SIERRA 2500 PICKUP 08-10 diesel. SIERRA 2500 PICKUP 07 new style (smooth door skin), diesel. SILVERADO 3500 PICKUP 07 new style (smooth door skin), diesel. YUKON 2004 -2005 exc. YUKON 2006 -2006 exc. The pulley is included unless it states "- pulley" below. No reservoir included. YUKON 2004 -2006 Denali. YUKON 2004 -2006 exc. YUKON XL 1500 2004 -2006 exc. LESABRE 96-05. NINETY EIGHT 96. GM 26086070 pump. REGAL 95 6-231 (3.8L), w/variable ratio steering (opt NV7). Rare and very hard to find power steering set up removed from a c40 truck with a 292 6 cylinder. This is complete with all parts need to install. Pump installs with the lower alternator bracket. This is a NOS 7834890 Gr.6.670 General Motors Power Steering Hard line assembly that fits 80-85 Chevy Citation. Has o-ring fitting. LKQ SKU: LKQ730 ~195593327 SPM01082. This is NOT a manufacturer part number, and can be disregarded. GMC Sierra 1500 2003-2003 crew cab. GMC Sierra 1500 2004-2006 crew cab, 4x4. GMC Sierra 1500 2005-2006 std cab, 4x4. LE/DEVILLE POWER STEERING PUMP FULID RESEVOIR.VERY GOOD CONDITION. 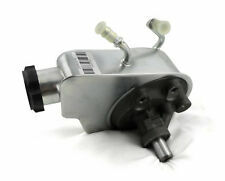 YUKON XL 1500 01-02 4x4, vacuum brake booster. YUKON 01-02 4x4, vacuum brake booster. YUKON 97 w/hydro-boost brakes. CHEVROLET 3500 PICKUP 97 drum rear brakes. GMC 3500 PICKUP 97 drum rear brakes. SUBURBAN 2500 97 w/o hydro-boost brakes; 13" rear drum. This part was removed from a 2013 SIERRA 2500 PICKUP with 122142 Miles (0 miles = not available or unknown). Model: SIERRA 2500 PICKUP. Part Condition Notes: POWER STEERING LINES. Year: 2013. REQUIRED: The complete hydraulic system of the transmission or transfer case must be flushed (including the cooler/radiator and cooling lines) and new fluid installed. Up for bids is a power steering pump that I bought for an S-10 that I never installed. The box says genuine gm on it and also says distributed by Isuzu parts distribution network. Part # 26039621. Free shipping. YUKON XL 1500 07-14. YUKON 08-13 w/o hybrid option. SILVERADO 1500 PICKUP 07 new style (smooth door skin), 4.8L. SILVERADO 1500 PICKUP 07 new style (smooth door skin), 6.0L. SILVERADO 1500 PICKUP 09 6.0L, w/o hybrid. LKQ SKU: LKQ386 ~183530636 SPM01082. This is NOT a manufacturer part number, and can be disregarded. GMC Sierra 1500 2003-2003 crew cab. GMC Sierra 1500 2004-2006 crew cab, 4x4. GMC Sierra 1500 2005-2006 std cab, 4x4. LKQ SKU: LKQ502 ~183714992 SPM00161. This is NOT a manufacturer part number, and can be disregarded. GMC Yukon XL 1500 2007-2014. We do our best to prevent these issues from happening and apologize for any inconvenience it may cause. LKQ SKU: LKQ312 ~206805855 SPM01082. This is NOT a manufacturer part number, and can be disregarded. GMC Sierra 1500 2003-2003 crew cab. GMC Sierra 1500 2004-2006 crew cab, 4x4. GMC Sierra 1500 2005-2006 std cab, 4x4. LKQ SKU: LKQ386 ~191673181 SPM00161. This is NOT a manufacturer part number, and can be disregarded. GMC Yukon XL 1500 2007-2014. We do our best to prevent these issues from happening and apologize for any inconvenience it may cause. Power Steering Fluid Reservoir ACDelco# 36-0060. Fits the Following Applications 1995 Buick Skylark 2.3L L4 VIN:D. 1996 Buick Skylark 2.4L L4 VIN:T. 1997 Buick Skylark 2.4L L4 VIN:T. 1998 Buick Skylark 2.4L L4 VIN:T.
LKQ SKU: LKQ136 ~177957439 SPM00149. GMC Acadia 2014-2016. GMC Acadia 2007-2013. This is NOT a manufacturer part number, and can be disregarded. Vehicle Model: Acadia. Part # or Vehicle Model: Acadia.